I should have been more specific - I'd like to get a page from every one of JB's first 30 issues (232-262). So far, I have a page from issues 242, 244, 247, 248, 250, 251, and 260. I have a page from 236 on the way. My page 251 purchase has made me realize that certain pages / issues are probably scattered in the wind. And I know there are certain issues that are entirely in other collectors hands (I'm pretty sure someone has most of 235 and 245). I've never seen or heard of a page from 249 or 259. I'm realizing that some of these pages are just in private / off-line collections, so I can't even attempt to throw money at the current caretaker. But it's a long term goal! Anyhow, that's a great Ron Frenz Spider-Man! I believe the Black Panther issue 241 is still complete. FF 233 was broken up a few years back those pages seem to pop up from time to time. Love Ron Frenz. I’m in the process of trying to find all his run on THOR. reading comics. Thrilled to own a page from this issue. Seth was such a great villain during this storyline. Arrived in the mail today. Commission from Steven Butler. Laren, very nice. I love the background on that. And now for the obscure. 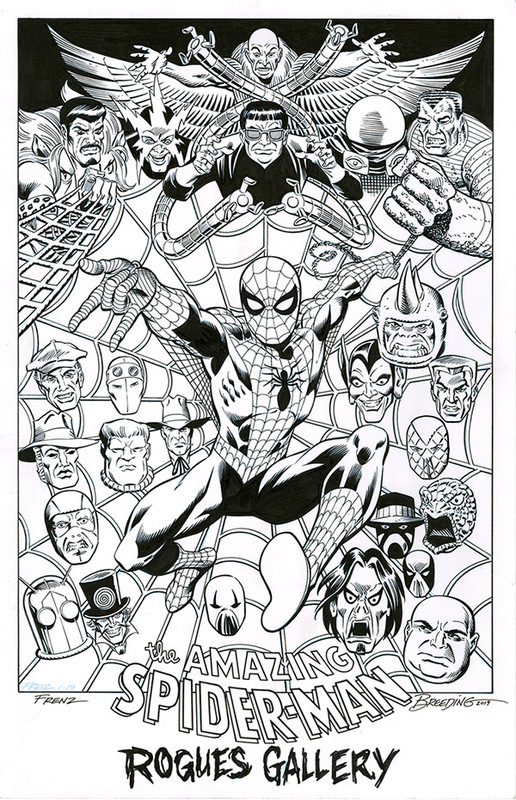 Shiny nickel to the one that can identify all characters in this commission by the elusive MC Wyman who I believe is a pseudonym used by several artist, correct me if I am wrong and if you have met him. How did you get a commission from a name many artists use as a pseudonym? I got it second hand from a guy that never met the artist. Just a correspondence through a generic email. Would have never thought to get this commission done until I came across it and had to nab it. This is on the way from Ron Frenz and Brett Breeding. I have not been posting in this thread for some time. alive, when looking at them. Andrew, I need all the nickels I can get. 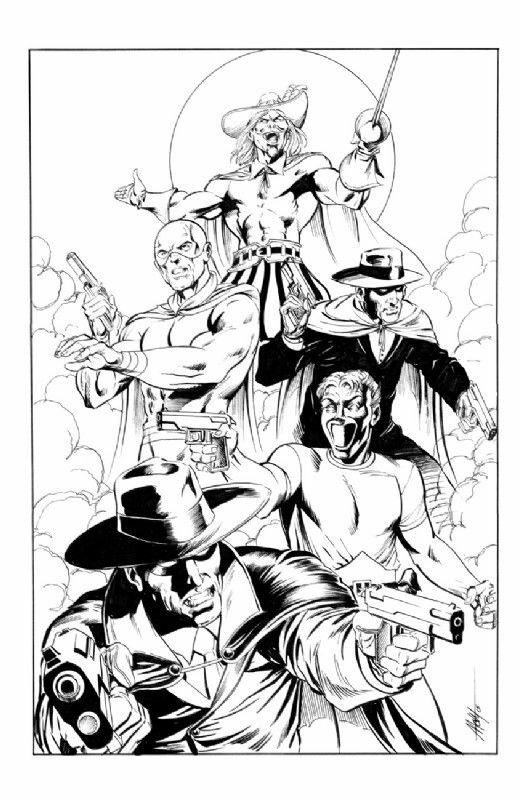 Those characters are the Blue Blade, the Witness, Mister E, the Laughing Mask, and the Phantom Reporter, golden age heroes revived by J. Michael Straczynski and Chris Weston for their Marvel series The Twelve. Fred, I can see why you'd be so happy. I'd be over the moon. That is some top drawer Hulk. Fred has one hell of an art collection. Was lucky enough to have won this on Comiclink last week. 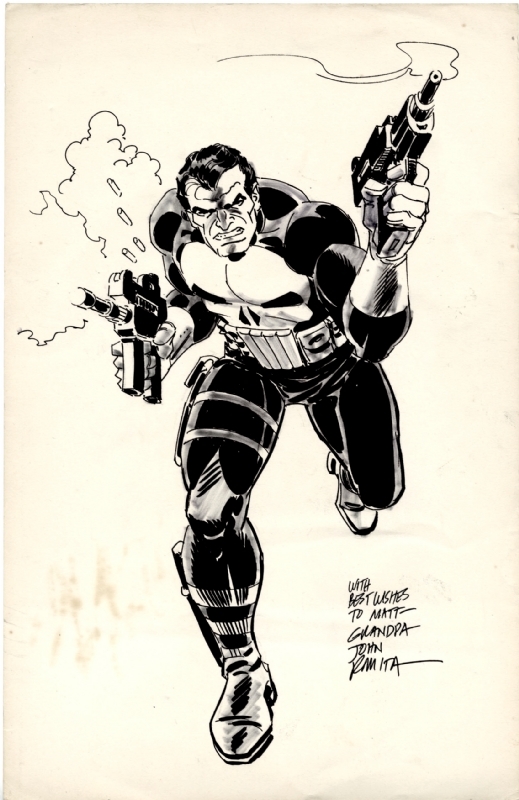 11x17 Full body Punisher illustration by John Romita, which was drawn for his Grandson many years ago. With the help of others, I was able to confirm the authenticity of this piece, and the story behind it. to finance them, by selling each of these. 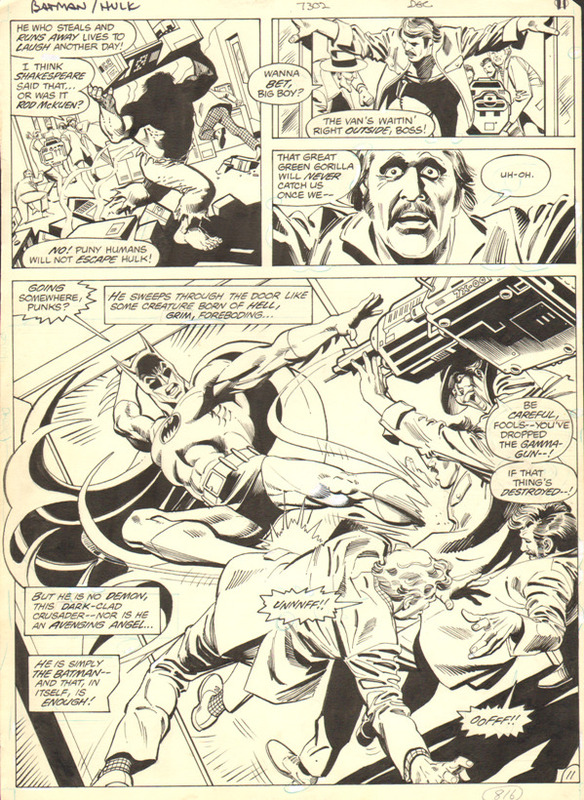 Dan Hubbarde, that's a very nice piece from Romita. It's kind of sad, though, that a personalized drawing to his grandchild was not kept in the family. Thanks Matt, and yes it was too bad that he sold his collection of art from both the Romitas. There is a long story behind it but to sum things up, Matt hasn’t spoken to them in many years. Toronto Comic Con was a success! 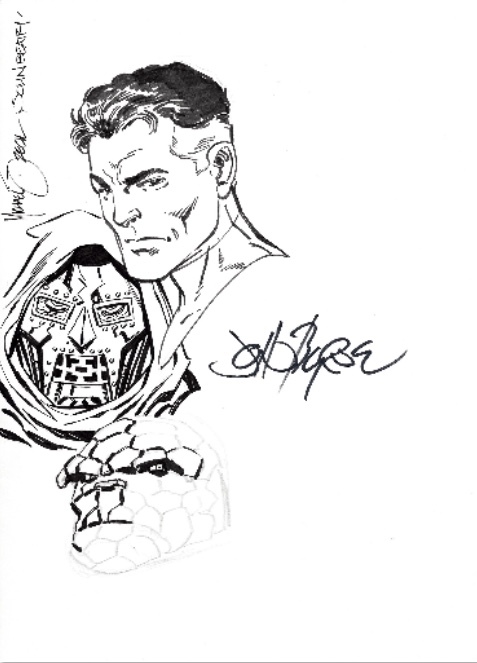 The latest addition to my Fantastic Four Jam I started with Byrne’s sketches, Mike Zeck pencilled Dr Doom and John Beatty inked it. More additions to come in the future! Mike and John were thrilled to work with Byrne. For the remaining characters, I have Art Adams, Joe Sinnott, and Walter Simonson in mind. Sorry for the poor quality photo, had to reduce the resolution ALOT. and moved, every time that I look at it. Fred, those are some great pages from the Batman/Incredible Hulk team-up! Nice!